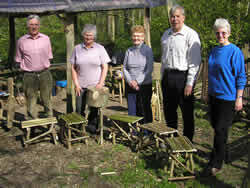 Some members of the History Group attended a Rustic Stool Making Course on Tuesday 21st April 2009. The Courses, held in Treswell Wood, are run by Skilled Craftsman Ray Lister and Samantha Pearce. Ray began the day with a potted history of the wood, explaining that it was ancient woodland of some 47.8 hectares which would originally have been oak. The wood was completely cleared during the war, for the war effort. There have been several different owners, the current ones being Nottinghamshire Wildlife Trust who purchased the wood in 1973. Today it is a Site of Special Scientific Interest. Ray then went on to briefly demonstrate what was involved in making rustic stools.The materials available were ash, willow and hazel, all grown and coppiced in the wood. Strips of these had already been chopped, prepared and sorted into several piles for the group by Ray and Sam. The tools required to make the stools included, hand saw, pull saws, hammers, drill, special nails, loppers or pruners and v-blocks (or large logs upended with a groove cut into them to hold the strips of wood making them easier to saw). The group were then "let loose" among the piles of cut wood to choose whichever they preferred - or a combination of any of the three - before commencing to make their own individual stools. As always, Ray and Sam instructed in a friendly relaxed manner whilst being informative and interesting, giving plenty of encouragement to the group to use their own imagination. Firstly, for each stool, four legs had to be cut of similar thickness and length, followed by four more to be used as stretchers, again of similar length. With these pieces two H style frames were made, each with two legs joined together by two of the stretchers. One stretcher placed level with the top of the legs and one a short distance from the bottom. Both stretchers kept on the same side keeping the distance between the legs narrower at the top than the bottom. All pieces were joined together with the special nails. The two H frames were then joined together with a longer stretcher attached between the two bottom stretchers, keeping these on the outside. Next the seat was constructed and here everybody did something different using lengths of one or a mixture of any of the types of wood available. Suitable wood was then selected for the braces with everyone becoming more adventurous by choosing more artistic pieces. Finally, four braces were cut, one for each side of the stool, added diagonally for stability. After that it was just a case of trimming and tidying up to complete. The only after care required allowing the stools to dry out slowly and treat with oil. About halfway through the day Ray and Sam took the group on a tour of the wood explaining how it is managed and coppiced, talking about the wide diversity of plants, flowers and wildlife attracted by the different habitats created. Coppicing usually takes place in rotation every 7 years. In the areas that are cleared, carpets of many different wild flowers cover the ground before the wood grows back again. Various animals have in the past been used to help manage the wood, including pigs, cattle and even horses when felling and clearing. Several rural craft courses are run throughout the year, within the wood by Ray and Sam, including charcoal making, willow sculpting, basket and chair making. Thanks to Ray and Sam, who clearly love their craft and the wood, the group had a most enjoyable day and the weather could not have been better. Everyone seemed well satisfied with their individual works of art, the only difficulty being deciding where best to place them when they got home. This is the third course the group have done with Ray and Sam and there was talk of possibly trying another!